German Chancellor Angela Merkel is pushing EU member states to do more to digitise the European economy, saying governments cannot take care of the transition on their own and must agree on tax benefits to support IT firms as quickly as possible. EURACTIV Germany reports. German Chancellor Angela Merkel on Thursday (4 December) called for more support for the digitisation of Europe’s economy. Despite her clear optimism, Merkel’s message also contained a clear warning that Europe has fallen much too far behind in certain areas – “for example in its ability to produce chips and establish large internet search-engines”. As a result, the Chancellor’s goal is to facilitate the foundation of startup ventures in the IT sector. 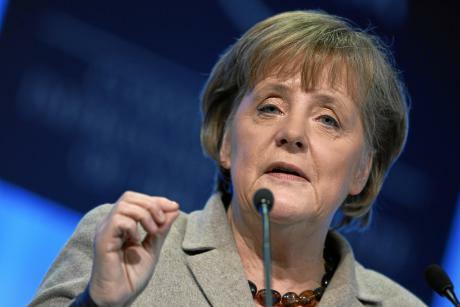 “State support programmes can only bridge the gap to long-term jobs,” Merkel pointed out. European countries must agree on which tax benefits are possible without leading to a case of state aid. At the same time, Merkel said it is not enough “to simply have money”. The appropriate regulatory framework must also be in place, she indicated. Prompt consultations over the basic Data Protection Regulation are also very important, the centre-right politician stated. It is not the first time Merkel has called on the EU for more support of digitisation. Not long ago, after Jean-Claude Juncker announced plans for a €315 billion growth package, the Chancellor explained that digitisation should be at the top of the agenda. Neelie Kroes, Günther Oettinger’s predecessor as Digital Commissioner, dragged her feet too often on issues like net neutrality and roaming fees, Merkel emphasised. But member states also shared the blame, the Chancellor said. Germany and Europe both have high hopes for Industry 4.0 – the fourth industrial revolution, driven by the Internet – to help boost the struggling economy. German Economic Affairs Minister Sigmar Gabriel recently committed the industry and economy to preparing Germany, as a location for industry, for the digital future. The latest statistics on EU growth show weak rates, with 90% of economic growth taking place outside the bloc. Europe is particularly hard hit by unemployment among young people. Unemployment rates among 15-24 year-olds is currently around 22%. Overall, around five million people under 25 are out of work. This trend could have devastating effects for future productivity of national economies, warn economists like former Nobel Prize Winner for Economics Joseph Stiglitz. But even these young people, for whom the internet is a fact of life – so-called Digital Natives – do not only see the benefits of digitisation. Recent surveys suggest that only 15% of Europe’s younger generation believe new technology could bring new jobs. Many even fear the technology will eliminate jobs. One survey showed that 33% of Germans between the ages of 18 and 30 reject a career in the digital economy. Dnevnik, EURACTIV partner in Bulgaria: ?????? ?????? ??????? ?????????? ?? IT ??????? ?? ?????????? ???? Soon Merkelchen will rally against a wall N°5.. The economical situation of many countries of the EU is quite unstable. Moreover Germany has not so many problems as for example Greece and Spain. The growing unemployment and the problems with immigrants have their impact on the economical situation. Even in the UK people tend to use financial help of http://vitaloans.co.uk/ just to make regular payments and pay for commodities and utilities. This is also a sign of bad financial situation of banks that can not provide necessary monetary help to citizens.